As part of the Blogger program BookSneeze, I was excited to pick up The Quotable Chesterton by Kevin Belmonte. In some ways, he’s like a Bob Dylan, everyone quotes him, but he’s not as listened to/read like he should be. GK Chesterton was a theologian that we, evangelicals should be reading more of. We don’t for a number of reasons. One is that he isn’t the easiest to read. Two, is that we have hidden him under CS Lewis (who loved and quoted Chesterton extensively). He said, “Chesteron had more sense than all the other moderns put together”. It’s this realization that Kevin Belmonte offers The Quotable Chesterton. He writes in the intro that Chesterton was quite the star in the early 20th Century. The Times tracked his life and writing throughout his career, even putting his death on Page 1 back in 1936. George Bernard Shaw considered him a “colossal genius”, F. Scott Fitzgerald and Ernest Hemingway found ways of including his writing in their books like The Man Who Was Thursday and Into Three-Day Blow. Everyone took notice of his faith, including the New York Times that wrote this of his legacy, “Mr. Chesterton talks about God because God is the most interesting subject for conversation that there is.” His most popular book Orthodoxy, is considered among the greatest of Christian classics. Being a book on quotes, it’s not exactly reading, but more of a resource or in my case, a devotional (like Proverbs). It’s in this way that books like these are of value. So if you are “C.S. Lewised Out” or in need of some “new old ideas”, or better, want to begin reading an often-overlooked brilliant literary and theological mind, pick up The Quotable Chesterton: The Wit and Wisdom of G..K. Chesterton by Kevin Belmonte. In One.Life, Scot McKnight offers a manifesto of Christian faith that beckons readers out of the rut of religious rituals to the high places of Christian living. What does it look like to follow Jesus? Find out what it means to embrace the vision of God’s kingdom in a way that awakens your finest dreams and shapes your entire life. It’s for everyone but who will really like it are … College Age/Young Adult students. Though anyone can read this book, Scot is in “reflecting outside the classroom” mode using examples of college age and young adult students. It will be appropriate enough for some senior higher students to enjoy and older readers who appreciate newer perspectives will like it too. Further, if you have been “raised in the Church” and feel either confused or disenchanted about what the Christian faith is about, this book is an excellent telling of what you may have missed/not given. For those of you to busy to read a lot … This is a fast read written in a popular level by a legitimate Christian scholar. For all the times you wished the academics would get out of their ivory towers, McKnight has not only left that a long time ago, but now he’s knocking on your door. Seriously, this is an easy and excellent read. What I really liked about it … I like how people like Scot talk about Jesus and how he articulates the Kingdom. It’s among my favorite subjects but what makes this book different from perhaps an NT Wright book is that it’s even more accessible to readers. Truly like the Eternal.Life chapter that focused on the afterlife, heaven and hell. It’s impossible to compare it to Wright’s Surprised By Hope (it’s not only half the size but a different type of book altogether) but those like me who have loved that book will appreciate much of what Scot says here. There was a part of me that wanted him to go further but what I really liked was the revealing of his inner monologue. It’s precisely the lack of this with so many other scholars/pastors who insist on certain parts of the after-life (as though they have been there) that puts off the Gen-Xers and Millennials. As I mentioned in the beginning, I’m a fan of Scot’s, have enjoyed his blog over the years and loved one of his more popular books The Jesus Creed. Again, One.Life is aimed to young minds and among the many wise words offered, his pastoral heart really emerges here. Those college students in his classes, his audiences, and here, his readers, are in great hands – I highly recommend One.Life. This is probably my last post in the “Youth Ministry and the Future of the Church” series for a while but I have enjoyed putting these thoughts out and have especially appreciated my local context friends expressing their thoughts (and at the very least … reading! – Seriously thanks). Be warned, I’ve tried to not be too provocative on these but I am finishing this post while listening to the new Radiohead album (really good). Had I finished this series without the mention of the word “Missional”, it would only be a matter of days that someone from my beloved seminary would have contacted me for failure to apply practical objectives. But even with that lurking threat, ;) I sincerely believe that youth ministry will need to evolve and become more missional. Before we dive in to that, a brief recap – My hope is that we will always support parents in the raising of young followers of a more Biblical Jesus with theological integrity. I hope we always provide opportunities for worship, community, learning and serving. Ultimately, I hope that the church will strengthen for the sake of the Kingdom. That said, there’s only so much parents and youth workers can do for students, and there are some things that a student must see and do for themselves. At some point, students need to read the Bible for themselves and not just be taught about it. At some point, students must pray for themselves and not just be prayed for. And at some point, students must participate in mission and not just be the object of it. It’s been my experience that if you want to convince a student to become less self-absorbed, you need to show them the physical/emotional/spiritual poverty of others. It’s among the reasons we believe in short-term missions and trying to create a sustainable and more consistent missional culture. This has been among the better aspects of our ministry. To be completely honest though, I join the many who have always been concerned with the virtues of the short-term missions experience. Looking back on the last five years however, I think our response to the concern has been part of what has made these opportunities helpful. We tell students that they need to share their summer with others. We tell them to be faithful with the opportunities provided on the mission trip and to allow their hearts to be broken. We tell them later, that they can’t care for the homeless in New Orleans or the HIV patient in the Bahamas and curse their mother under their breath and ignore the socially marginalized in their school. In leaving our zip code, God has taught us a great deal about the people in it. Now “being missional” is more than participational, it’s formational and communal as well. But among our problems is that our youth ministries are limited by the participational aspects of joining in service in the Kingdom. We use a fair amount of sending language in our youth ministry. We even have students who say things like, “I am salt and light on my team/group/band.” That’s a great starting point for a young Christian and my hope is that we serve our community as individuals, families, and as a local church. To do this, I think a few aspects are needed. One we need to be missional church-wide. Like many things, it must be part of our culture to serve and not just a “hobby” that the students do. Two, we need to confront and dismiss the consumer culture that exists in many of our suburban churches. There’s a lot written about that on this blog and so many other places but consumer culture is suffocating us. Finally, and I know how general this sounds, we must collectively pursue the mission of the Kingdom in the way Jesus modeled – liberation, provision, healing, sacrifice, forgiveness, redemption, all in the name of God’s love. In the ministry I am serving in, we have had some amazing moments, some terrible ones, mediocre seasons and some real beautiful ones too. We are praying that we are on the Spirit-led road in being a strong church following Jesus. I truly believe that what we are doing today not only matters for now but for the evangelical church 30, 40, 50 years from now. Thoughts? In the previous post, I made the case that we need to present a more Biblically responsible vision of Jesus. In this post I want to insist on the second part of that – youth ministry needs to go deeper theologically. Also in my previous post I am aware that I came across strongly towards my church upbringing. My intention is certainly not to offend anyone, especially those that served in this way. That said, if the goal of youth ministry is to train disciples in the way of Jesus, I think it’s appropriate to say that we haven’t always been faithful and effective with that great responsibility. Now, I”ll save describing how/what I changed for a different post but basically my teaching style is aimed at two audiences, “The church brat” and “the newbie” (At least that’s how I plot in my mind) but I am convinced that we need to offer our academically-geared, post-Dawson’s Creek, sophisticated suburbanite student some deeper Christian teaching. I know that not each of our students are AP and Ivy League bound and some have trouble focusing and such, I get that. But when focused, students can really engage in what is being taught (especially if you can tell a story), the God-sized world of youth ministry is profound. It is no surprise that this need was one of the attractions to the emerging church discussion. I remember hearing Tony Jones at a YS Conference in 2003 saying, “We need youth ministries with theological robustness.” We’ve heard him and others say that or similar countless times (for more check out youth pastor Dan Haugh talk about the need for better theology in youth ministry here). 1. Youth workers who love theology and are trained/in training to teach it. A. Seminary training is helpful. B. Solutions for the many that can not/don’t want to go to seminary. 2. A church culture that values theology for the sake of glorifying God (and committed to not break fellowship over “proper doctrine”). A. This comes not only from the church leadership (pastors/elders) but must also be from our homes. B. More books/training resources similar to Mike King and Chris Folsmbe. Youth Ministry has come a long way since I was a kid in the late 80’s-early 90’s. I remember clip-art with white surfers/skaters always saying that Jesus was Radical!! Tubular!!! Outrageous! Sorry not enough exclamations there, I mean OUTRAGEOUS!!! (need one for each member of the Trinity). Unless I am mistaken, it was believed that if we could make Jesus relatable enough and “cool” enough, our young minds wouldn’t be able to help ourselves and we would fall madly in love with Jesus and reject our cultural’s non-edifying values and live happily ever after. A funny thing happened though, it was pretty much the opposite of all that. My friends and I were fairly polite, we tolerated the “Sk8r boi Jesus” but similar to how Jesus lost many of the 5000 with the “Unless you eat the flesh of the Son of Man …” part, He lost us also with the “Jesus is Gnarly” part. Trouble is, one is found in the inspired text and the other in a flawed methodology. I always knew Jesus was good, but in my teenage mind, he reeked of desperation and seemed a bit insecure, you know with all the searching for identity stuff. There was also a very high amount of guilt in many of the messages I heard in the late 80’s/early 90’s. I wasn’t quite sure if it was because he lost some of his skater/surf endorsements but for a “chill” guy, he seemed pretty consumed with my thought life and I kept hearing how angry he was about it. That said, my real problem was while I had been convinced that Jesus loved me, I had no idea what the Bible was really about. For years, it was a fragmented collection of stories (like Daniel and the Lion’s Den), parables (like the Prodigal Son), data to be largely ignored (Numbers, Leviticus, Acts) and words of comfort (from select Psalms, the Gospels and Pauline references). Oh – there was Revelation and a handful of prophecies warning us that Russia was going to attack us (This is true, I grew up toward the end of the Cold War era). Imagine my relief when I discovered a better vision of Jesus. Soon after that, I was humbled by the beauty and awed by the brilliance of the Bible. Content with a better understanding of the Messiah, jaded by my impressions of the Church, it was no wonder that I (and so many of my friends) loved movies like Dogma and Saved! 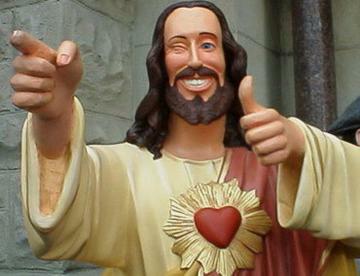 I admit, I still laugh every time I think of “Buddy Christ” (It’s not Jesus they’re making fun of). It is possible years from now my current students will write blog posts (or whatever it will be then) about the times we used the metaphors in movies for an entire weekend, week-long mission trips, Crowder-stye music, documentaries on human trafficking and suggest how this was counter-productive to their faith but it’s the best I know to do and may the Lord use me in spite of myself. Along with my calling and my desire to be faithful, this tongue-in-cheek fear keeps me motivated. And here is today’s thought – For the sake of our Church’s future, youth ministry today must not only be Jesus-centered but give a Biblically-responsible Jesus. I tend to refrain from posting these thoughts that contain themes of patriotism, World history, Mid-East perspectives, etc. but I am among the millions that has been extremely concerned for Egypt and though I know no one who is a supporter of Mubarak, seeing his resignation is welcomed and troubling one. As an American-born son of Egyptian Christian immigrants, I find myself grateful in many ways. I am grateful to be part of the US for many reasons. I am grateful to my parents and for our Egyptian heritage, particularly the Christian and the ancient parts. And obviously as a pastor, I am thankful for my faith and Christian upbringing. The trouble has always been for me is that these identity-shaping factors tend to collide into each other quite regularly. A glance at my loving family and friends’ Facebook walls would verify this quite easily. I saw one person tweeting from Egypt saying that Mubarak leaving Cairo doesn’t mean anything, I’m sure he’s deleted it by now. I saw another’s Facebook status praising God for a victory that reminded me of how many people celebrated Obama’s election. I want to be clear here and say that I am not pro-Mubarak in any way, nor am I anti-Obama, but I among the many that see these events as extremely complicated and even more, I am very concerned. 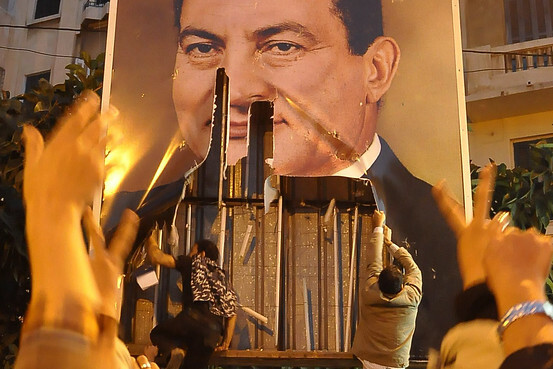 Mubarak’s timing of announcements are extremely odd. One that says, he won’t run in the fall, then a pre-recorded announcement last night saying he is staying in power, then less than 24 hours later, an announcement from his Vice President. I would have liked to see a six week transitionary plan in place to avoid the possible nightmare scenarios that will occupy our thoughts for many months. But for a host of reasons I will never know, that is not going to happen. See this widely-circulated WSOJ article for more. Some are wondering why Obama and our Administration were not more involved. News of Obama and Mubarak in communication is a bad picture in the eyes of many in the Middle East. But I also find it interesting that many of who have said this are also against the wars being fought in Iraq and Afghanistan and regularly accuse the US of being imperialistic. But be assured, the US and its allies have been on the phone with the powers that be. I was among the many that was moved to near tears when I saw Christians and Muslims protesting together. I could not get the Nevine Zaki picture of the Christians forming a circle around the praying Muslims out of my head for days. And further, I was so blessed to read of the news that Muslims formed a similar circle for an outdoor Coptic Mass that had taken place in Cairo. Still, I am extremely concerned of the fate of the Coptic and Protestant Christians. I pray and fast regularly for you. As politely as I can, I’d like to say to my Western friends that the Middle-East mentality, though beautiful, is quite different than ours. So comparing Western codes and events to the ME is a bit of a stretch. With the same loving and polite intent, I’d like to remind my MidEast family & friends born overseas and born here that we are biased, hurting, hopeful, anxious, and passionate people. We and especially our families still there have much to lose and much to gain. Let’s be honest and just in our rhetoric and for those of us who faithfully Jesus, let us make every effort to be Spirit-led, Christ-like and give the Father glory for the great things He has done and will do. “The Story of the Egyptian Revolution” – By Sam Tadros – from the American Thinker site. Lengthy but a fantastic on the ground read. Make sure you read what he says about El Baradei. And lastly, my dad’s interview for a local news station. This post may be a bit more case-specific but it has been occupying my mind lately. For the last few weeks, I’ve been leading an adult Sunday School class entitled, “The Faith of the American Teenager” based on Smith and Denton’s Soul Searching and Dean’s Almost Christian. Their research insists upon the parents are the greatest influence of their student’s faith; not the youth pastor, not the youth volunteers, not the great camp speaker or the celebrity Christian, but mini-van driving Mom and sandal-and-socks-wearing Dad. For years, many youth ministry types have said similar. I have also heard it in the form of, “They may drive you crazy but you need to get parents involved in your ministry!” or “Parents can be a youth pastor’s worst nightmare or best friend.” The youth pastor-parent relationship has been a dicey one to say the least. In my church, we have always seen youth ministry as a support to the home but we have always felt that we are not utilizing the full potential of this belief. Many of us have been talking about this for some time and lately, more conversations are forming as well. That’s right, the wolves are laying down with the lambs. Like most youth pastors, my relationships with parents has been diverse. Some have given me nothing but grief and blame, others have given me too much credit and of course many in the middle. Overall and over the years, I have enjoyed wonderful and encouraging relationships with many families and consider parents to not only be allies, but friends and co-laborers (and know that it matters to me that I write these words with integrity). , I have/am seen/seeing that when there is trust between parents and pastors, there is better ministry in and out of the home and in and out of the “youth room”. In previous posts I have been stating that in order for their to be a healthy vibrant church in the future, it needs to be discipleship based now (read Christ-centered, relational, etc.) and second, it must be focused on the Millennials as we focused on the Boomers. Today, I want to emphasize that youth ministry has to to go beyond “allowing parents to help out once in a while” and truly partner with parents in the development of their children’s faith. Some families/churches are already doing this, at least in some ways, while some have out truly outsourced their child’s spiritual development to a weekly program that is scarcely attended and some are confused why their child lacks spiritual identity. A ministry that partners with parents requires more than emails and newsletters. Frankly many parents have told me kindly that they do not “really read” correspondence from the church which makes things hard (I literally have an email and a weekly handout that is called, “News You Need to Read” but what can you do?). I’ve attended seminars and read articles/books that have focused on ministry to parents and while there are many excellent thoughts and ideas, it will take a reculturing and new understanding of youth ministry for all of us. It’s when we understand and care about the objectives that we not only read emails and correspondence but serve together for the collective goal. The Sunday School class I have been teaching has reinforced this and a few have suggested that we do something like this a bit more frequent. Today I am brainstorming out loud that while I would like to teach/lead more discussions with parents, I think it’s also necessary that parents teach/lead these discussions to each other. This seems logical for youth workers like me who are in their 30’s and whose oldest child is not yet three. I truly believe that youth ministry today serves the future church by not only bridging the gap between the parents but truly serving the parents. This raises many questions, like what about parents who are not believers or very dysfunctional, certain types of churches, etc. But these are matters to be resolved in a healthy culture, not reasons to be released from purusing it. I keep trying to remind myself of that. So yeah, the first thing I think of when hearing parents working with youth workers for the sake of their students is the wolf lying down with the lamb, Bill Gates and Steve Jobs drinking coffee together, and Brett Brett Favre playing for the Minnesota Vikings – oh wait :) Well, anything is possible you know. If you are new to my blog, I offer a sincere welcome. I am among the many youth pastors that takes this aspect of the Church very seriously. In short, I really believe that the Church is going to have to focus a lot of its efforts to the family, our neighbor’s family and our enemy’s family. Hopefully, I’ll get to some of that later. To summarize the last post, youth ministry must center on discipleship in order for their to be a future church (and of course a present one). 1. I don’t really know what the future church is going to really look like. And honestly, I don’t really think anyone really, really does but some people get it better than others. 2. I do agree with those that say the mid-size church will be disappearing over the next 50-100 years. A. Thus we will be left with big churches (more than 1000) and small churches (under 100, but probably much, much smaller). B. Presumably, there will still be professional youth ministry in the bigger churches and probably one or none professional clergy in the small churches. C. Both types will need to focus on youth ministry but of course, a different type of one than is happening today. And here is this post’s main point – Soon, today’s churches will need to focus on the Millennials the way it focused on the Boomers. It’s a bit “Captain Obvious” in some sense, but in another, it isn’t. From where I sit, family ministries in many churches serve as a “service” to attract more Boomers. For a number of reasons, including the decline of the evangelical church, we are going to need to focus on the Millennials for their sake. Think of it this way, as good preaching (and the worship experience) is to the Boomers, community and identity will be to the Millennials. The Boomer Generation churches were built on good preaching. Guys like Bill Hybels & Rick Warren illustrated this. I know, I know, it was much more than good preaching. Their seeker-sensitive, purpose driven approaches were keys in their ministries’ success. I get it – but they are extremely gifted communicators and I am pretty sure if you put Rick out in South Barrington and Bill out in Lake Forest, you’ll get something like Saddle Creek and Willow Back. But here’s why churches will no longer be centered on preaching – the digital age has made sermons available to everyone. I am literally listening to Rob Bell right now and boy is he awesome (and Warren and Hybles are only a few clicks away). Further, I don’t need my pastor to preach like him, because I subscribe to him and a few others through iTunes. And even further, i don’t want my pastor to preach like them because imitation is the mother of flattery but the harlot of ingenuineness. Don’t get me wrong, preaching is always going to be important but even in my lifetime, I have seen that dramatically change (which is a strange comfort to pastors who want to pastor and not just preach and scary thought to pastors who have inferior relational skills but are spectacular speakers). But where the church is going to need to step it up is the place of creating community. As our culture becomes more secularized, the local church (and not the building) is going to have to create that culture and it will not be able to rely on the once a week Sunday morning worship preaching experience. You know who doesn’t have a once a week Sunday morning worship experience? The youth group. In fact, for many of us, the Sunday school hour is the weakest part of our ministry because it meets at a time when our target audience is barely awake. Now, what you are about to hear could simply be dismissed as another youth pastor delusion but I am thinking that as time goes on, the youth pastor (family ministries, next-generation) position will be the focus (sorry worship pastors :). This does not mean that the youth pastor is going to have the big office or be on the cover of Christianity Today. But it does mean that the position/job description is going to change which is going to change the entire approach as well. Here’s what it also means, youth ministry won’t be the “entry level” position for twenty-somethings with goatees and spikey hair. But it won’t be the Warren/Hybles guys either. The “successful” youth pastor will be the facilitator/organizer whose gift is creating community among teenagers. Don’t worry, he/she will speak too but this person is a creator/organizer/facilitator of youth ministry culture. (If you want a quick read, I recommend Doug Pagitt’s Church in the Inventive Age). The landscape is changing, dramatically but not completely. For instance, there will always be the “celebrity pastor”, there will always be the best-seller, every corner of every sub-culture will always have the old “it” person and the new “it” person – that’s not what I am talking about. But the need is community and identity, especially among the Millennials. Thus, growing churches are going to be the ones that are serious about ministering to teenagers and children. And the intentionally-minded churches (big and small) are going to pursue this need with creative and brilliant approaches with the similar urgency that it pursued the Boomers. All in all, I appreciated Dr. Chand’s book. As you can tell from the title, every church/organization has its own culture that must be understood before strategic planning then implementation can take place. In some way, it’s “captain obvious” but as obvious as it, I know of very few leadership books that spend an adequate amount of time offering perspectives on understanding your church’s culture. My favorite chapters were 1 (Culture Trumps Strategy), 4 (Vocabulary Defines Culture) and 7 (Changing Vehicles) and they probably best contain the outworkings of his thesis. Chand offers some solid thoughts in those chapters (and throughout the book, of course). It’s easy for me to see why this is a part of the Leadership Network Series, a “brand” I take seriously. Those who will profit the most from it are “big church guys” in traditional churches that have a big boat to turn around. They are the illustrations most often used and most of the chapters assume you are leading or a part of a larger pastoral staff. Consequently, pastors of smaller churches may like it but may have trouble implementing a lot of the principles. And lastly, those a part of missional-type churches will probably appreciate this the least (though there’s plenty wisdom for you too). As I was reading, I kept having two thoughts: One, I need to read more leadership books and I’m glad I’m reading this one. And Two, When is he going to get to the part of connecting with the actual congregation. There’s so much attention in dealing with the large church staff, when is the pastor going to communicate his vision that has been tailored to the culture that he and his staff have finally cracked?? The answer is Chapter 7 and that’s my only criticism, it happens a bit too late and is not enough (though Ch. 7 is lengthy). I personally would have liked to hear more of Dr. Chand’s advice relating to the congregation because he seems very qualified. But the problem for me is it’s easier to change your staff culture because at some point, they know they will be dismissed if they don’t get on board. What do you with a church that doesn’t get on board? And what do you with your church when their culture is not to get on board? Again, Chapter 7 (and 8) helps but I would have liked to see more of the book focused on that (as the title implies). Once you understand the trajectory of the book, I think most will appreciate it and find it insightful. It’s clear, every church has a culture and leaders need to understand it in order to lead it. My calling/vocation of youth ministry has been on my mind a lot lately and there are a number of reasons for that. For a while, I hesitated in really blogging about youth ministry because there was always the tendency of coming across as either bragging or complaining and I feel I do enough of those already. I’ll do my best here to be as honest and fair in a Christian way as I can but please remember I offered this disclaimer (and for those of you who despise disclaimers, appreciate the fact that some of us really do need them). Like so many, I am interested/concerned/excited about the future of the church. And because of that, I am also focused on the present church. I am among those that feel that we should be stronger and more faithful to the way of Jesus and among the many reasons, consumeristic spiritual mentalities, personal selfishness, pseudo-Christian homes, poor church leadership is also inadequate youth ministries. I don’t believe the problems have anything to do with liberalism, secularism, or pluralism as countless books of the last twenty, thirty (forty?) years have insisted. A long time ago, I heard someone say something like. “Fix the heart, fix the home, fix the church, fix the world.” It was way too linear for me but it stuck. There is truth in it but the landscape is quite complicated these days and questions emerge like, “What exactly is the heart and what would you fix it with?” Someone (like me) would quickly say, “With Jesus of course!” and that questioner who ask with all sincerity, “Which Jesus? You have all these traditions and denominations that all claim to be Biblical interpretations from the Bible, it’s really confusing ….”. Good point, we need to fix the church too. Which “church”? Hmmm … you see where I am going with this. Given that people like me (youth pastors and vocational clergy) need to do our part in our own Christian devotion, our own families, loving our spouses and children, etc. But further, the Church needs to get out of the keep “their people happy business” and get serious about discipleship and worship for all ages and among other factors, it’s clergy that need to champion this. As a youth pastor, I find that we are many times guilty of saying/doing similar things. Many times we take the easier way out and attempt to “build a youth program” that fails to do several things. It fails at discipleship in favor of attendance and good times, fails at supporting the home and community (at times undermining the home/community) and fails to inspire a sustaining hope and belief in the way of Jesus that matures in later adolescence and adulthood. Don’t get me wrong – a lot of fantastic things are happening in the Kingdom of God, but I believe that we can/must do more to have a stronger present Church for the sake of the future Church. Thoughts?